We're once again opening our doors to friends and family! Come tour our school at Shaw Towers, Beach Road, learn more about our programmes and meet the Team! Highlights include activities organised by LeClare such as Story Alive!, Music & Movement and Visual Art Experience. 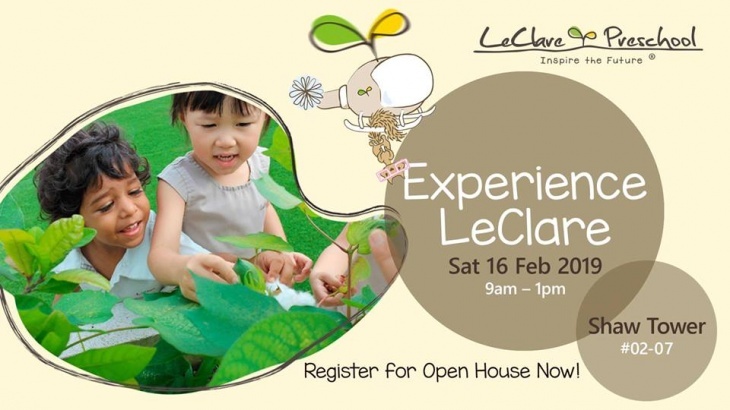 We are also providing guided school tours, when you can meet the LeClare Team! Don't forget to book a school tour* for yourself while your children take part in activities conducted by our Team! BONUS Registration Fee will be waived for same day registrations! Registration fee is a one-time payment of $300.